The article, published in June 2017 (Issue #9), describes how the decrease in providers and increase in demand is causing healthcare companies to create tele-psych networks. 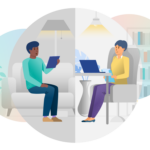 It goes on to elaborate how telepsychiatry has grown exponentially within the past decade, especially in rural areas, and how investors are driving its rapid technology and platform development. Telemedicine Magazine is a print publication distributed quarterly to approximately 30,000 readers, including physicians and C suite health tech executives. The magazine covers the telemedicine, digital health and virtual care markets. InSight is listed under the “Market Watch” section of the print article as one of the top companies to look out for in the tele-psych space. Other organizations mentioned are Iris Telehealth, JSA Health, Brighter Day Health and We Counsel.